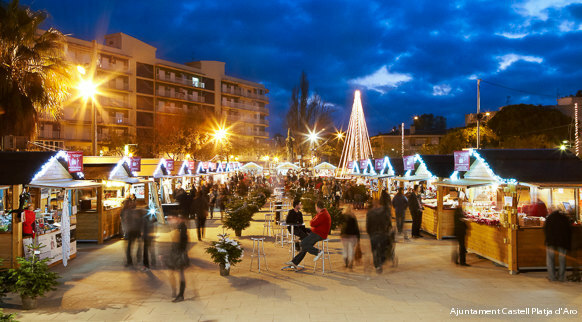 Christmas markets and fairs From 01/12/19 to 26/12/19. If you're looking for decorations to liven up your Christmas celebrations, come and visit the Christmas fairs and markets. You can find all you need at the Christmas markets held in many towns on the feast days of various saints: Saint Nicholas (6th December), Saint Lucia (13th December), Saint Thomas (formerly, 21st December), Saint Stephen (26th December). There are plenty of options to choose the day that suits you best. If you enjoy displaying a decorative nativity scene at home, there are lots of stalls selling all the figurines. Typically, the baby Jesus and his parents Mary and Joseph (flanked by an ox and a mule) are surrounded by shepherds with their flocks, the Three Kings and other figures. In Catalonia the classic caganer also forms part of the scene. Traditionally a shepherd, this defecating figurine is tucked away discretely in a corner. It is said that he represents ordinary people and the ironic character of the Catalans. The variety of caganers on sale is astounding; you can find not only shepherds but politicians, artists and sporting icons, along with other well-known personalities. You'll also find the tió (the Christmas trunk that "defecates" sweets for children when beaten with a stick), along with all sorts of typical Christmas decorations, such as candles, Christmas wreaths of holly and mistletoe, strips of lights and other items from imported traditions, such as Christmas trees. And if sweets are your thing, you'll find delicious temptations in the form of the typical torró (nougat), neules (tube-shaped light biscuits) and marzipan figures, which come into their own when accompanied by the wines and liqueurs produced in this part of the world.